On 24th October a large gathering of family, volunteers, members and close associates, met at the Waterworks Museum in Hereford at the invitation of Emeritus Chair Dr Noel Meeke MBE, who will shortly be stepping down from his formal roles at the Museum after two and a half decades as a Trustee and a Director. Primarily a social event, a personal thank you for the support he has received over many years, Dr Meeke entertained his guests with an informal talk on the ‘weird and unique qualities of water’. This complex subject, which is of great personal interest to him and highly relevant for the Waterworks Museum, was wonderfully simplified and brought to life by an illustrated, and occasionally humorous, talk that entertained everyone in the audience, who ranged from school children to nonagenarians. During his closing remarks, Noel Meeke referred to the vision of Stephen Southall who in 1960, as the Chairman of the Herefordshire Water Board, visited Broomy Hill Water Treatment Works and determined that the mothballed steam engines he saw should be preserved and that the water pumping station should one day become a Museum. The vision of Stephen Southall, who was the first Chairman and later President of the Waterworks Museum, continues to be supported today by his family charitable trust. In closing, Noel suggested that perhaps the Museum might think in future terms of enhancing its education provision to include the science of water. At the end of his talk Noel Meeke was presented with a fine painting on behalf of Dŵr Cymru Welsh Water – a major benefactor of the Museum since its establishment 45 years ago, to recognise his personal contribution to the development of the Museum. 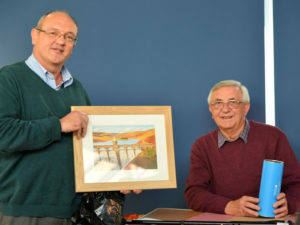 Tom Packham (left), Estates Business Manager of Dŵr Cymru Welsh Water, presenting a painting of Craig Goch dam in the Elan Valley to Dr Noel Meeke.